Last week I had my first ever Award Show on The Cask, be sure to check it out! So here we are again with another discount single malt Scotch. If you remember from the Award Show Speyburn 10 Year came in 4th place and got me hooked on the search for another great Scotch for a great price. I definitely didn’t find it this week. 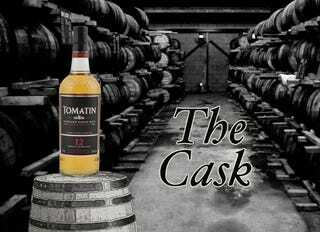 A bit about the Tomatin Distillery- Tomatin has been in the Scottish Highlands since the 1800's and they have a wide range of available Single Malts. The 12 year which I had is their “entry level” and it goes all the way up to 36 year. The price is perfect for a 12 year Single Malt Scotch and while I hadn’t heard anything about it at this price - I had to grab it and give it a try. So unfortunately the Speyburn 10 is still the drastically better Scotch despite being 2 years younger. I mean drastically. I don’t know if this Tomatin 12 needed a few more years or if it’s just wrong. I got the weirdest tastes, slight bite at the beginning and a touch of burn at the end but soft/smooth as could be in the middle leaving a bit of a honey after taste. That middle smooth part was missing something though. It was almost flavorless at that portion of the experience. It just fell completely flat. I hate to say it but I think this one’s going to be on the shelf for a while, it was basically intolerable without a few ice cubes. The ice helped a lot but it’s still borderline. I’ll go back to it and see if my opinion changes, but I doubt it. I can tell you that for $32 I have a lot of better options to spend my money on. Alright guys, let me know if you what you’d like to see on The Cask! As always, have a great weekend and drink some good Whisky! Let me know if you find something good!